Tis the season for eggnog, stockings, gift giving, excess sugar, and graphic design. At Zucchini & Vine, there is a great deal of holiday merchandise coming in and many more customers looking to purchase gifts for Christmas, we hope. I've been busy photographing products for advertisements and updating website design with the same images. 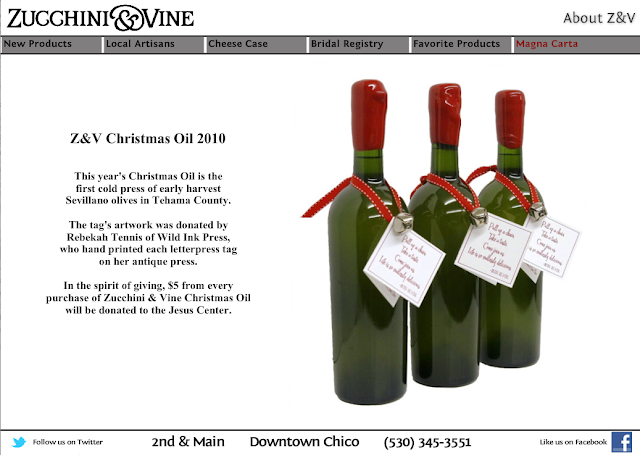 In today's Chico News & Review, Zucchini & Vine is advertising their first cold press of Sevillano olives, our Christmas Oil 2010. It's buttery, smooth, and a little peppery at the end, just like me! You can view the image on its own page at Zucchini & Vine's website or below. Which end of you is peppery? Don't answer.